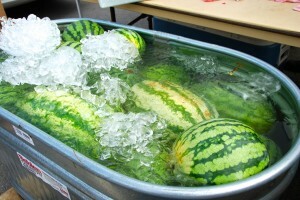 Never mind what the temperature was for this years Watermelon Festival. 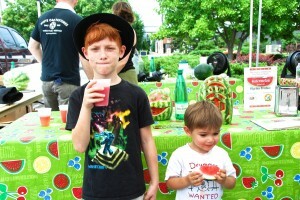 This past Saturday, it was a chilly day at the Franklin Farmers Market, thanks to icy-cold watermelons and frosty Melon Mania drinks. 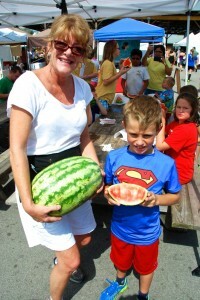 It was all a part of the FFM’s big Watermelon Festival 2014 presented by Whole Foods Market. Fast eating makes for plump cheeks! 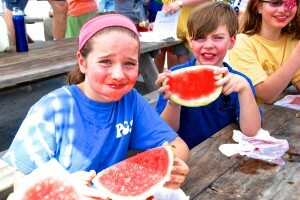 From the seed-spitting contest to the fastest watermelon eating competition, it was a great day of fun. 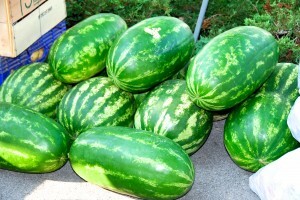 There were sweet watermelons everywhere to enjoy on the spot or take home to enjoy later. 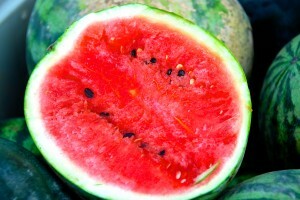 Lots of you got a taste of the Watermelon Basil Feta salad featured in the market’s “Eating in Season” cookbook. 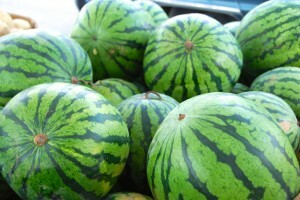 Prepared by Chef Michael Martin of Whole Foods, the salad was made with watermelons from Pilgrims Produce, Colbert Family Farm, Kirkview Farm and Bloomsbury – Spring Meadows Farms. 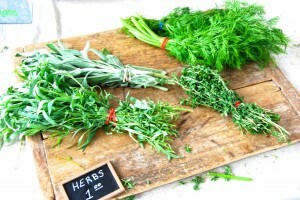 The feta cheese was from Noble Springs goat dairy farm, and the aromatic basil was grown by Beaverdam Creek Farm. All of the ingredients came from local farms and salad samples were being eaten as quickly as Chef Michael could prepare them! 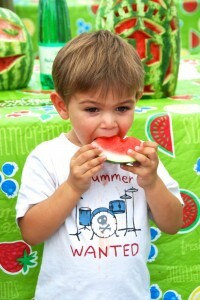 So despite the soaring temperatures of the day, everyone had a great time at the farmer market Watermelon Festival. 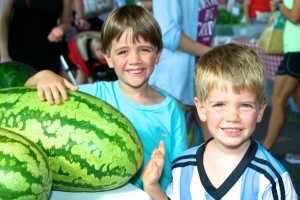 Thanks to all of you who came out to the FFM for the Watermelon Festival and many thanks to our good friends at Whole Foods for helping to make this year’s festival a great big juicy sweet fun day at the market! 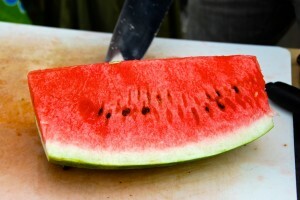 We’ve celebrated some summer favorites, like the watermelon, tomatoes and strawberries, and there’s always deliciously fresh farm food at the market. But what else is going on this year? 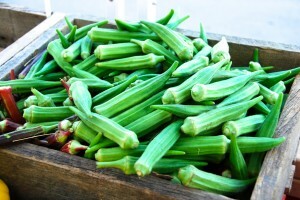 Here’s a hint – Scarecrows, turnip greens and cornbread. What does that mean? 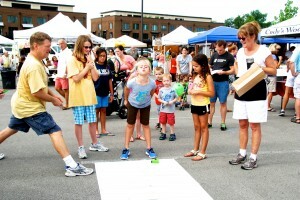 Find out with a look at our new Events page. 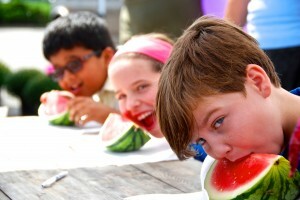 Finally, you know with seed-spitting and hands-behind-the-back watermelon munching, there’s got to be some great photos from the market’s Watermelon Festival. 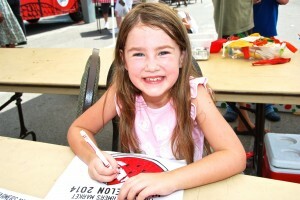 Visit the FFM’s photo gallery to see for yourself! This entry was posted in Market Saturday News on August 25, 2014 . 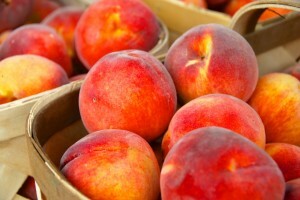 Ah, typical August weather – hot and muggy for our Saturday morning farmers market. 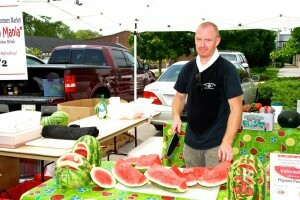 But that didn’t keep it from being a great day at the Franklin Farmers Market this past Saturday. 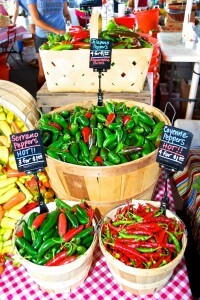 Everything you could possibly want to eat was at the market. 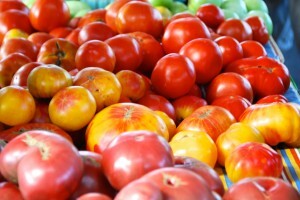 Tomatoes, cantaloupes, peaches, green beans, squash, okra apples, jams, breads, pies, cookies, milk, butter, muffins, lettuces, potatoes, meat for the grill – you get the picture. 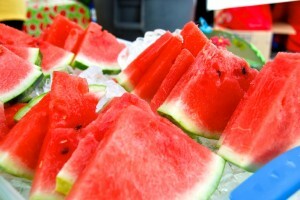 All good fresh stuff to eat that made a little hot weather not such a big deal. 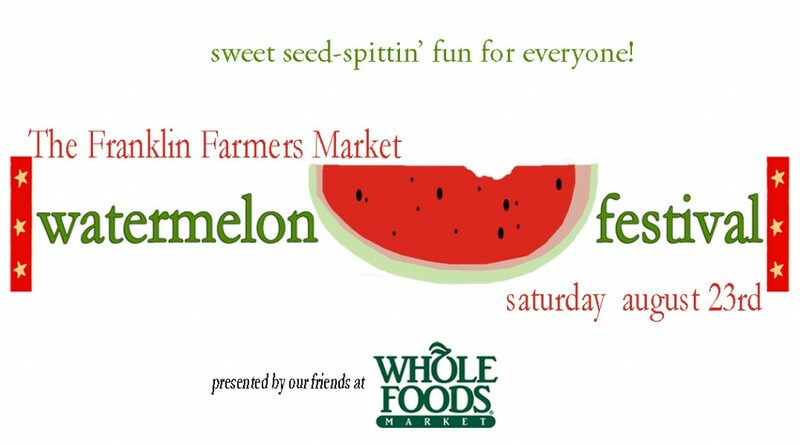 We saw a lot of you heading home with watermelons for a sweet juicy treat and maybe to practice your seed-spitting skills too. 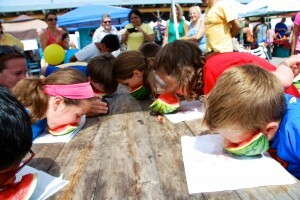 After all, the FFM’s Watermelon Festival is coming up on August 23rd and the big seed-spitting contest is always a lot of fun. 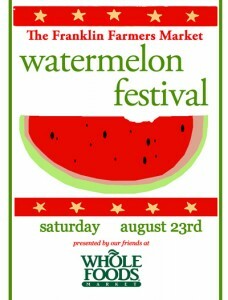 This year’s festival is sponsored by our good friends at Whole Foods. 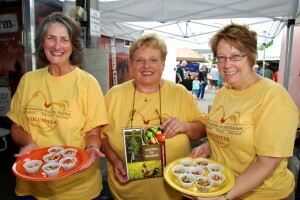 And did you get a sample of the good food they had at the market’s cookbook booth? 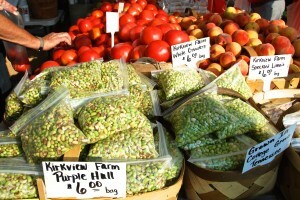 It was a cold tossed Salad in a balsamic dressing with field peas and other fresh veggies from the market. 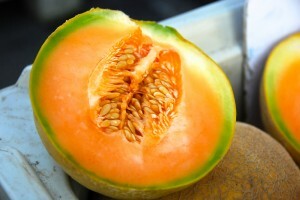 The recipe for it is in the FFM’s “Eating in Season” cookbook. 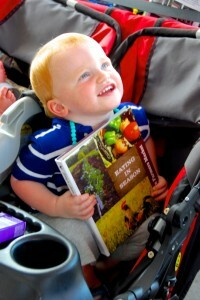 The cookbook is broken into three sections, featuring recipes for fall/winter produce, spring produce and summer produce. 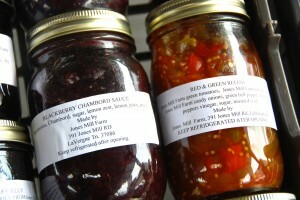 It’s a great gift for your favorite chef and at just $15 (plus tax), it’s a great bargain too! 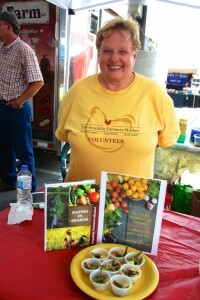 Look for the FFM’s cookbook booth every Saturday at the market. 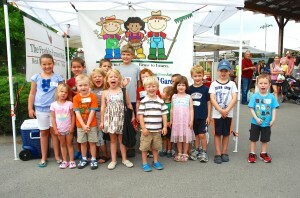 Some of our future Tennessee farmers from our Growing Kids Educational Garden visiting on “Ask the Farmer a Question” day. 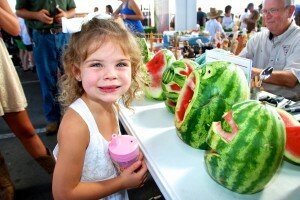 You might have noticed a bunch of little farmers roaming the market this past Saturday too. 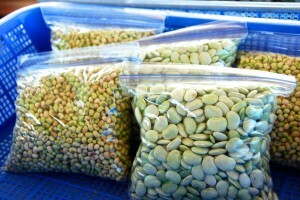 It was field trip day to the FFM for the children of our Growing Kids Educational Garden program. 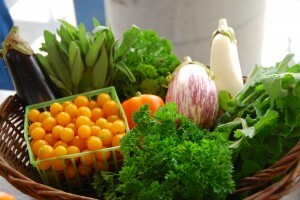 The program gives kids hands-on lessons about the good health values of fresh food along with a greater understanding of where food comes from. From the worm “hotel” to the “poop pot” class, the kids get the chance to learn a lot about gardening and the environment. 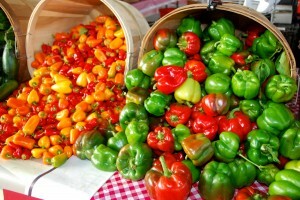 The kids went around the market to talk to the farmers, ask questions about the farms and pick out a nice bunch of fresh food to take home. 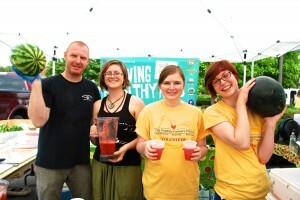 Take a look at what was going on at the FFM this past Saturday. 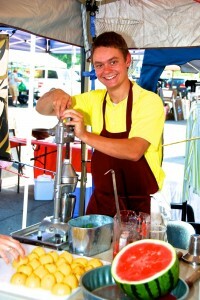 Click here and visit the market’s photo gallery! 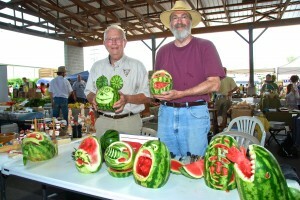 This entry was posted in Market Saturday News on August 11, 2014 . 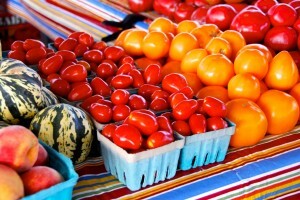 National Farmers Market Week, Buy a Tomato! 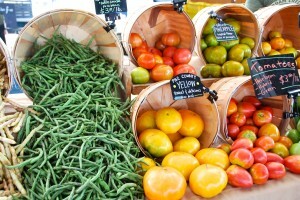 This week is National Farmers Market week, a time recognize how important farmers markets truly are. 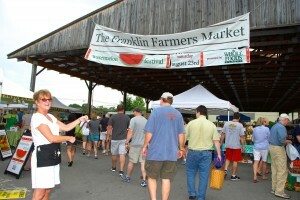 When the Franklin Farmers Market was created, we had three goals in mind – to help local family farms be productive and profitable by providing a reliable venue for farmers to sell what they grow or produce; to give everyone easy access to fresh, healthy food straight from Tennessee farms and to educate people about the positive impact that farms have on the local economy, communities and the environment. 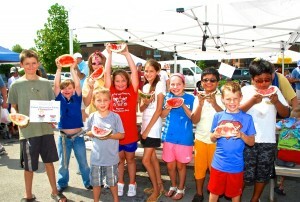 When the Franklin Farmers Market began, we had only 8 farmers. 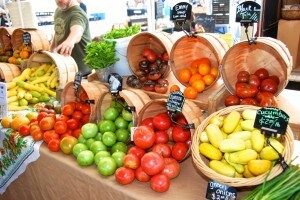 Now over 70 farms have participated in the market with a diverse selection of food at its freshest and most flavorful. 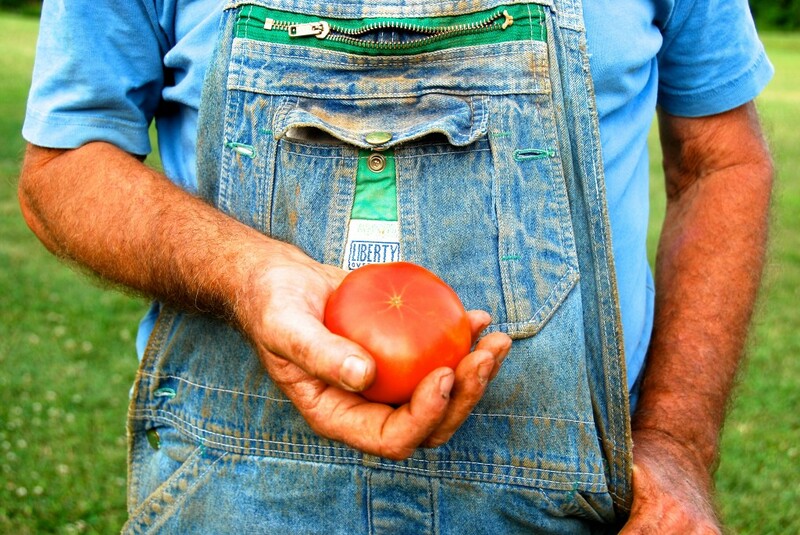 Every day, a farmer puts food on the table for you. 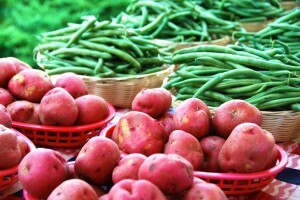 With no farms, there’s no food. 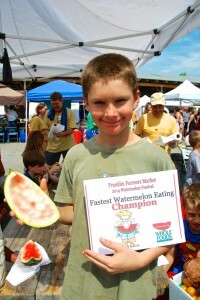 Your support has made the FFM one of the biggest farmers markets in the region. 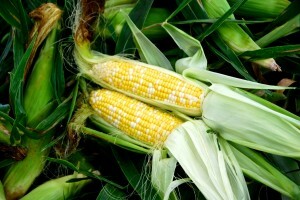 But more importantly, you are helping to keep our farms green and growing. 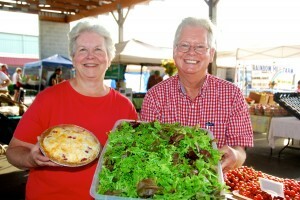 Thank you for supporting the Franklin Farmers Market and the farms of Tennessee. 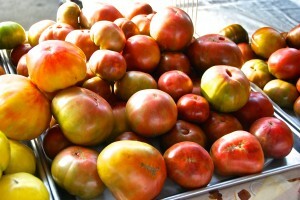 Visit our farmers and come buy a tomato from a local Tennessee farmer this Saturday with over 30 different varieties to choose from. This entry was posted in Market Saturday News on August 7, 2014 . 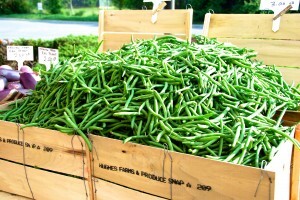 When everything is ripe and ready, from green beans, corn and tomatoes to melons and purple hull peas, it’s called the peak summer season for local farm produce. 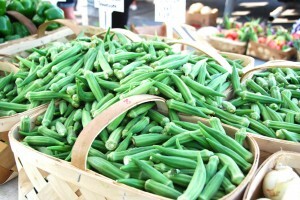 And that’s what it is right now at the Franklin Farmers Market. 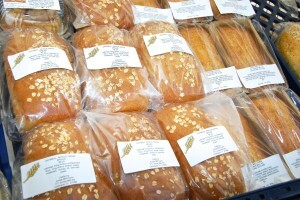 This past Saturday at the market it was a foodie’s paradise. 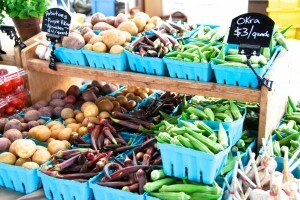 Peppers of all sizes and colors; potatoes, onions, squash, cucumbers – you name it, we’ve got all your local farm produce now at the market. 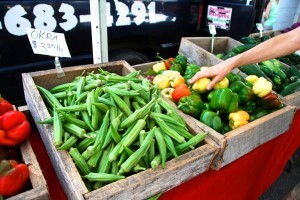 With all of that good fresh food at the FFM, it’s appropriate that this week, August 3rd – 9th is National Farmers Market Week, celebrating the 8,100-plus farmers markets across the USA. 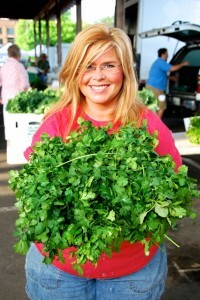 We’re proud of our farmers at the FFM. 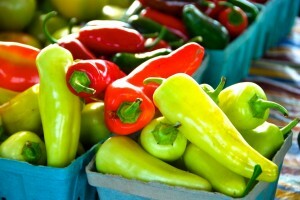 They work hard to provide you with the best in fresh local farm produce year-round. 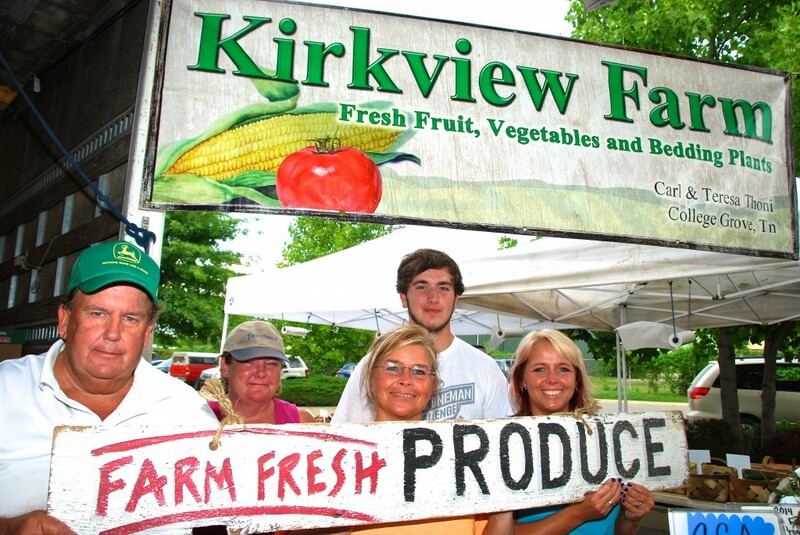 And we’re proud of you too, because by shopping at the Franklin Farmers Market, you keep Tennessee farms green and growing. 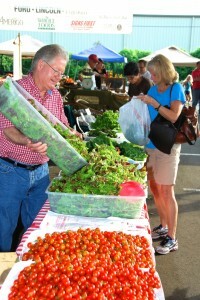 Find out more about the farmers at the market with a look at the FFM Farmer profiles. 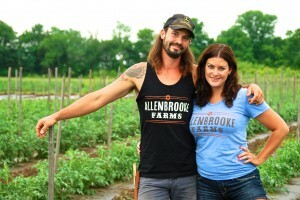 You can get details on your favorite farms, see great photos and even watch videos about the farms. 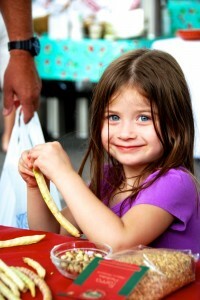 And as always, there were some great photos taken at the market this past Saturday. Did we snap one of you? 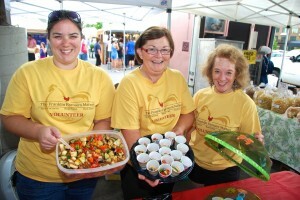 Find out with a visit to the Franklin Farmers Market photo gallery! This entry was posted in Market Saturday News on August 4, 2014 .